Canterbury had been a garrison town for many years before the war, and when hostilities began between Britain and Germany, it was home to The Buffs (East Kent Regiment). Canterbury had been a garrison town for many years before the war, and when hostilities began between Britain and Germany, it was home to The Buffs (East Kent Regiment). They were immediately mobilised for war and replaced in the town by the men of the West Kent Yeomanry, a Territorial unit, along with their fellow territorials, the Kent Cyclists, who despite their mode of transport, were an infantry battalion of the British Army, who were formed in 1908. They were tasked with guarding key points along with patrolling the Kent coast line. 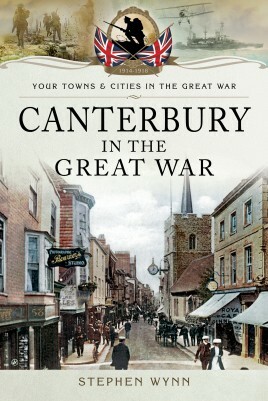 During the First World War, Canterbury was one of the counties main recruiting areas, particularly for those men from east Kent. By the end of the war, thousands of men had enthusiastically made their way to the towns Drill Hall in St Peter's Lane, to sign on the dotted line, so that they could do their bit for King and country, in the nations hour of need. By the end of the war, statistics showed that one in four men had enlisted in the British Army. The towns civilian population did their bit for the war effort as well, with many of them, both men, who were unable to do their bit militarily, in such and women. Some worked in the hazardous surroundings of munitions factories, whilst others worked for the Kent VAD, as nurses, cooks, cleaners or orderlies, whilst others worked as air raid wardens. These were extraordinary times that relied on ordinary people to pull together, and do their bit in what ever way that they could, for the common good. The people of Canterbury were not found wanting.